Can You Get Fit in a Month? Most everyone harbors fitness goals and aspirations. While many health and diet programs offer a time limit -- 30 days to your new body, for example -- it is unrealistic to believe that all shapes and sizes can reach size zero in a month's time. However, it is entirely possible to lose weight, become healthier and replace bad habits with good ones. When it comes to weight loss, calories are given a vast amount of attention. The general rule is you must consume less calories than you burn in order to use up stored fat. While some dieters try to make drastic, abrupt changes to their eating habits, it is more realistic to make changes slowly. Swearing off sugar and carbs for a month is not only extremely difficult, it can come with unwanted side-effects such as headaches, crashes, jitters and a sense of failure if you splurge. Instead, make small, long-lasting changes such as swapping store-bought muffins for a bowl of bran cereal with fruit. Have a salad with your sandwich instead of chips. Pack yourself snacks to avoid being tempted by a candy machine. Nuts and fresh fruit are healthy, delicious treats; avoid drinking your calories through soda and alcohol. Following this plan for one month can have noticeable affects on your body. A single pound of stored fat adds up to 3,500 calories. By cutting 500 calories from your daily meals, you will effectively lose a pound per week. In a month, that equals four pounds lost. Exercise is key to achieving a more fit and healthy body. However, 30 days is not sufficient time to see major results. In a study performed by Dr. Carl Foster, exercise physiologist at the University of Wisconsin, participants who followed a six-week exercise program were rated at the same attractiveness level both before and after the study. This should not be a source of discouragement however, as the study only measures physical appearance. 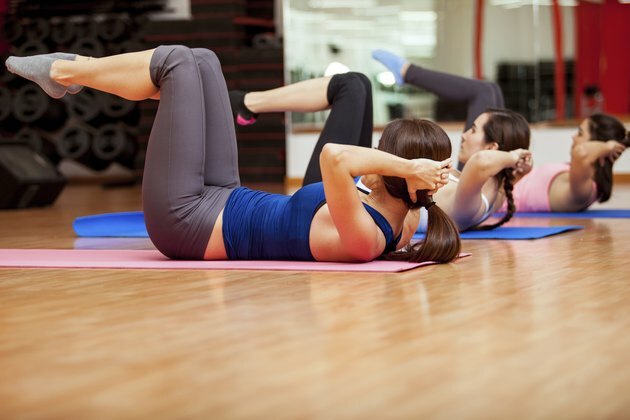 Maintaining a proper exercise regimen for one month has benefits unseen by the eye. The American Heart Association recommends a minimum of 30 minutes per day, five days per week. For optimal results, engage in cardiovascular activity daily. This could include 30 minutes of jogging, bicycling, hiking, swimming or playing sports. Stick with your favorite or try something different each day. Setting aside a specific time in your schedule for fitness will help you stay committed. Also, include at least two days of strength training each week. You may use weights -- such as dumbbells or a barbell -- or simply let your body weight work for you. Some examples of body-weight strength training include pushups, pull-ups, chair dips, planks, crunches, squats, lunges, calf raises and wall-sits. Together, these moves create a full-body workout that you can do anywhere. A month of fitness will create healthy habits that can last a lifetime. While physical changes may be minor within the first 30 days, you will succeed in training your mind and body, leading to stronger commitments and continual results. By adjusting your lifestyle to include cardiovascular exercise, strength training and healthy eating habits, you can expect to have more energy, less stress, stronger bones and muscles and an overall feeling of confidence and wellness within the first 30 days. For physical changes, each person and body is different. Those who are naturally slim yet new to fitness may see physical changes faster than those with a greater weight-loss goal. Can You Get in Shape in a Week?